Mother’s Day is this weekend and we all love our Moms so why not make them a little something special to remind them how much we love them. So Moms look away, Dads, kids, grandparents, and spouses pay attention! 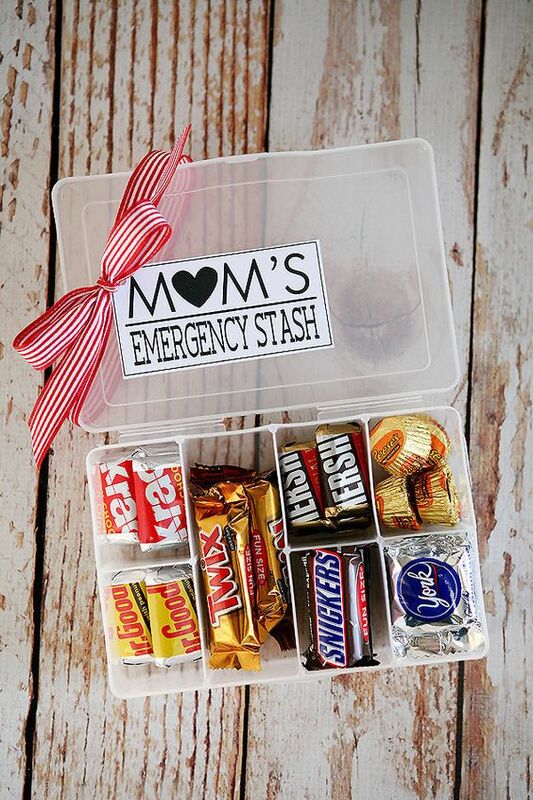 Mom Secret Stash: All Moms have a favorite snack, and by favorite we mean they do not like to share it with ANYONE. For me its chocolate. After a long day of “mommying” it up I want to hide with a small sweet morsel and unwind. However, it can be hard to keep those sweets out of my little ones hands. 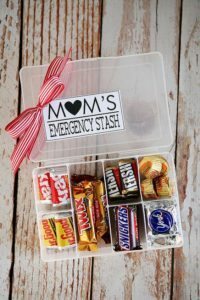 So this year why not make Mom a little secret stash of all of her favorites. It is a sweet idea with not a lot or hard work. Trust me, Mom will appreciate it. 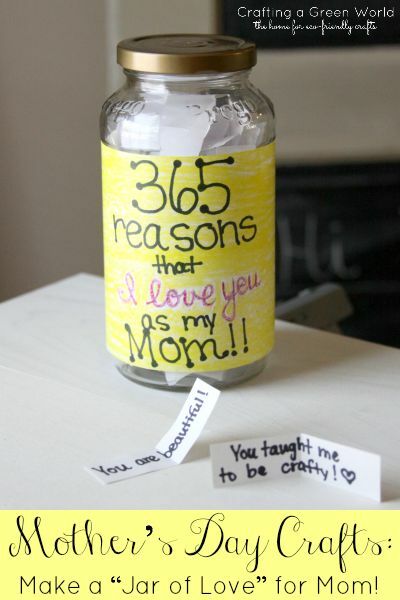 365 Reasons We Love Mom: This fun little idea is actually available at Big DIY Ideas. It is so simple, it is not expensive, does not require a great crafting ability, and all of the kids can help, even the littlest ones. It is a gift that Mom will cherish forever. Moms love those sappy mother’s day gifts, and what is sappier than a jar full of all the reasons why we love her? DIY Succulent Rock Garden: I LOVE succulents. I Love plants. But, I have a black thumb. My kids know this, and have started to buy me only succulents, but I have even on occasion killed the succulents. This adorable little succulent would survive even at my house! It is made form rocks. Your kids can design and paint their very own succulents and design you the prettiest flower pot ever. Best part? It never needs to be watered! This entry was posted in Activities and tagged crafts, crafts for mom, DIY, DIY gifts, gifts for mom, moms day, moms day gifts, moms stash, Mother's Day, mothers day gift idead, mothers day gifts, succulents, why we love mom on May 10, 2018 by Lacy.